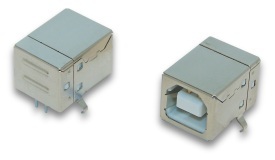 These are USB Type B Female connectors and are typically used on a USB device or peripheral. These are Right Angle PCB Mount connectors. These are rated for use with USB 1.1 connections and are RoHS compliant.